1 Welcome to Bangkok Upon arrival, meet & greet at the airport then transfer to the hotel. After check in, free & relax on own. Overnight in Bangkok. 2 City Temple Tour – Royal Grand Palace & Emerald Buddha Breakfast at hotel and then sightseeing tour to visit: At first visit to Wat Traimit, the Temple of the Golden Buddha, the temple is famous for its 900-years old five-and-a-half-ton solid gold image, and then continue to visit Wat Arun, perhaps better known as the Temple of the Dawn, is one of the best known landmarks and one of the most published images of Bangkok. After that, visit to Wat Po, the largest and oldest temple in Bangkok, as well as the largest single Buddha image: the Reclining Buddha (Phra Buddhasaiyas). The temple is also known as the birthplace of traditional Thai massage Reclining Buddha. Lunch at local restaurant, after lunch, we continue to visit the most famous tourist places in Bangkok, Royal Grand Palace and Emerald Buddha. The Grand Palace adjoins Wat Phra Kaew in a common compound, and is where you will end up after exiting Wat Phra Kaew. Despite the proximity of the two, there's a distinct contrast in style between the very Thai Wat Phra Kaew and the more European inspired designs of the Grand Palace (the roof being the exception). After this place we back to the hotel and free at leisure. Overnight in Bangkok. 3 Bangkok – Koh Samui Today early morning, pick you up at the hotel and then transfer to one of the most attracting floating market of Thailand namely Damnernsaduak Floating Market. There you have a chance to take a boat observing the lifestyle of local people along the small canals. Not only do you visit the coconut farm and taste some coconut juice but also you will find the variety of seasonal fruits such as rumbutan, mangoes, papaya and etc. Then, we return back to the hotel and free at leisure or shopping in the afternoon. Overnight in Bangkok. 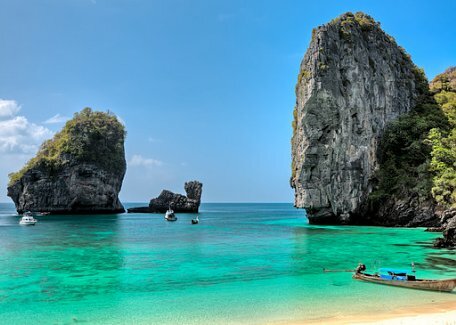 4 Bangkok – Phuket After breakfast, free at leisure till time transfer to the airport for flight departure. Breakfast at hotel, and then join transfer by minivan to the pier for take a speed boat trip to Phi Phi Island. 12.00pm Arrive at “Phi Phi Don Island” enjoy feeding the Monkey by a piece of bananas. 12.30pm Lunch will be served at Phi Phi Don. 03.00pm Arrive at “Khai Nok Island” enjoy your activities like swimming, sunbathing and feeding fishes. 04.00pm Back to Chalong Pier and transfer to your hotel. 6 Phuket Free Day Breakfast at hotel, and free all day on own. Overnight in Phuket. 7 Phuket – Bangkok – Departure Breakfast at hotel, then free at leisure till time transfer to Phuket airport flight back to Bangkok. Everything was perfectly organized and we never felt lost. Both guide and driver were great people. 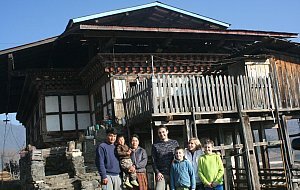 Although we have seen a quite good deal of the world, Bhutan was the top experience, which enriched us a lot.